Last night, CNN’s Arwa Damon received an award from Oxfam honoring her reporting on the Syrian Civil War. The network’s senior international correspondent has spent a decade reporting from some of the world’s most dangerous and fascinating places -including Iraq, Egypt, Turkey, Thailand, and now Syria. Earlier in the week, FishbowlDC was able to get Damon to answer some questions for us about her work. 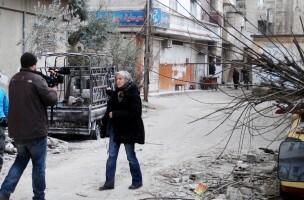 Q: In your reporting on Syria, you’ve been involved with some truly devastating situations. How do you keep from being overwhelmed by all the terrible things that are happening around you? A: It is overwhelming and at times suffocating. Seeing others’ pain – watching as they cope with the tirade of emotions that comes with the unbearable loss of a loved one – can leave you feeling utterly helpless. The only thing we can do is try to the best of our abilities, knowing that we can never fully succeed, to portray that to our audience in hopes of raising awareness and generating change. The hardest part about Syria is that the sense among myself and many of my colleagues is that we must have somehow failed, that we’re just screaming into a dark vortex. I can’t even begin to recall how many times I have been asked a variation of the question: “What’s the point of talking to you? The world is mocking us, listening to us, watching the videos you shoot and what’s on YouTube and yet, still mocking us. How can no one care?” And I can’t answer it. I can’t explain how the world can watch and do nothing. And for me, it’s the guilt that is hardest to deal with because it causes me to question my own capability as a reporter and wonder if we should have pushed boundaries even further. Was there a way to better tell the story? Did we communicate the desperation as best we could? Did we highlight the sheer magnitude of the disaster that would have had the impact to generate help for the people? Q: Does it make it difficult to be objective about what’s happening, when you are a witness to the pain caused by war? Or does objectivity be come less relevant? A: Bearing witness to the pain breeds compassion, which I think is necessary when it comes to reporting on human suffering and emotion. I do not believe that allowing a level of compassion into reporting comes at the expense of objectivity or responsible reporting. Q: Would you recommend your line of work to other journos/aspiring journos? A: Yes and no. It can be extremely fulfilling, but more often it’s utterly crushing. War zone reporting has an aura of glamour about it, but there is nothing glamorous about death, killing or just about anything that one confronts in the field. You don’t know how you are going to react to a situation until you are in it, and by then its too late because the impact – whether physical, mental or emotional – is unavoidable. You will invariably sacrifice a part of yourself that you can’t get back.